The U.S.A. is a very large and very diverse place to visit. Something for everyone, as they say, from a fantastic system of national parks through large and densely settled urban areas with lots of museums and other cultural things to see and do. Here are some suggestions, or at least reports of trips I have made. For budget places to stay in the United States, get The Hostel Handbook. It lists the HI hostels (with the HI stamp of approval and the HI rules, both pro and con) plus a lot of independent hostels which tend to be more fun. Traveling across the U.S. can be a great experience when exploring by boat. Many adventurers choose to buy a Viking Yachts for sale to be able to travel the coastline, stopping at many marinas and cities along the way. 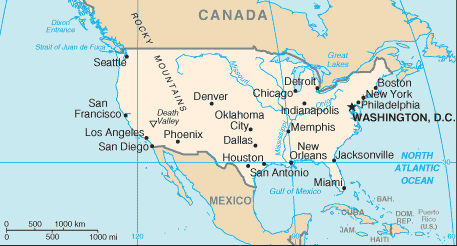 U.S. Government map of the continental United States. Alaska has its own page. The Carter Center is interesting. So is the Martin Luther King historical site, although it's embedded in a downright scary neighborhood. But one of the most memorable features of Atlanta is the shuffling zombie army of vagrants and beggers. It's the place that I've most felt like I was in a Bruce Campbell movie. Corner of Ponce de Leon Avenue and Boulevard Avenue, 10 AM on a Monday. #4 & #5 are across the road, partially hidden by signs and utility poles. #9 & #10 are just out of sight to the right. They congregate in the parking lots of fast-food restaurants and abandoned businesses, especially near intersections. If you're on foot, they will see you coming and move to intercept. Then when you cross the street, you're hit by the cluster on the opposite corner. They don't take "no" for an answer, and may follow you for some distance. Creepy and threatening? You bet. On the somewhat positive side, I was there once during the mild Georgia winter, when some charity had distributed thousands of serapes to the homeless. That gave the atmosphere a little more Clint Eastwood and a little less Bruce Campbell. Anyway, a very nice place to stay at the time was the Atlanta Hostel, in a former brothel at 223 Ponce de Leon Avenue. 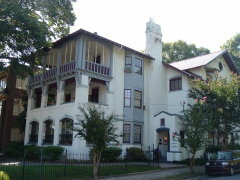 Atlanta Hostel, in a former brothel on Ponce de Leon Avenue. The MARC commuter train runs about every hour between Baltimore and Washington, it costs US$ 7. However, it is intended for working commuters, not visitors, so it mainly runs Monday through Friday with limited weekend service. 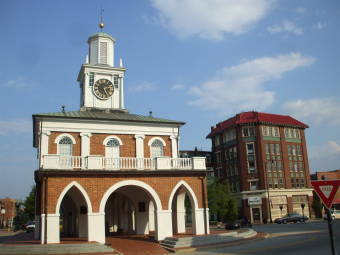 Baltimore also has frequent Amtrak service, at least once an hour for the Washington — Baltimore — Philadelphia — Trenton — Newark — New York — Boston route. If you have a car you might check out the National Security Agency's museum if you're interested in WWII history or information security. It's between Baltimore and Washington, a little closer to Baltimore. You can take the light rail line to the BWI airport, and then it's about a 20-minute walk to the Historical Electronics Museum. It's nice to visit if you're interested in radar, radio, military communications gear, or information security. The HI hostel is pretty nice: 12 Hemenway Street, +1-617-536-9455. The International Youth Hostel in the southeast corner of The Loop is one of the best official HI places I've ever stayed. Very nice rooms, many en suite, a nice breakfast, a nice lounge area, and a real atmosphere to the place. Get around on the CTA. You can get a one-day pass good on the subway, Elevated and buses for $10. It's good for 24 hours from first use, not midnight to midnight as in many cities. They also have 3-day, 7-day, and 30-day passes ($20, $28, and $105 respectively). Any of them makes it cheaper if you take at least three or four rides per day. Detroit is filled with some amazing architecture in a post-apocalyptic setting. Much of the city appears as if humanity largely died off several years ago. 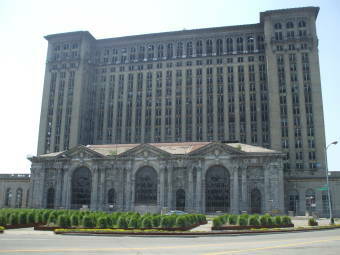 I stayed at Hostel Detroit in the northern part of the Corktown neighborhood, just a short walk from the Michigan Central Station seen here. I ended up in Fayetteville, North Carolina with some free time on my hands. I was to have done a cybersecurity course for some staff at the U.S. Army Special Operations Command, but the class got called off half-way through. 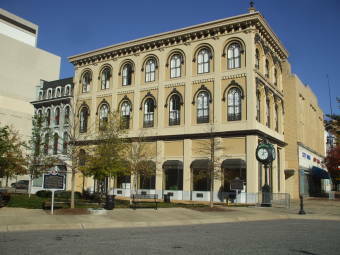 There are the old buildings of Fayetteville and its history. 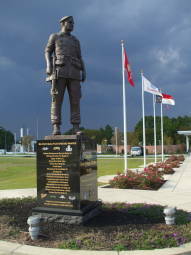 Also, there are three military history museums in the area: the 82nd Airborne Division Museum and the John F Kennedy Special Warfare Museum, both on Fort Bragg, and the U.S. Army Airborne and Special Operations Museum on the edge of the old downtown in Fayetteville. Stay right on Venice Beach at the Venice Beach Samesun, formerly the Venice Beach Cotel. A very nice location, and a very cool place to stay! For transport from the LAX airport, take the airport shuttle bus to the bus terminal in Lot C. Take the Santa Monica Big Blue Bus #3 to where Lincoln crosses Venice Boulevard, then change to the LA Metro #33 or #733 bus to Venice. 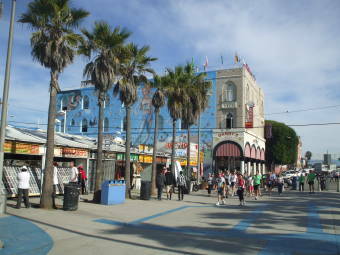 Just $1.50 for the Santa Monica bus plus $0.30 for the transfer. I have some suggestions if you happen to find yourself in Montgomery, Alabama. You can see the bus stop where Rosa Parks boarded a bus, sat down, and later refused to give up her seat just because a man who had boarded happened to be white. For this she was arrested and fined, but that led to the Montgomery Bus Boycott and a major step forward for Civil Rights. That's the bus stop itself at right. There are other sites related to Civil Rights history including Martin Luther King's church and the exact spot where George Wallace made a point of standing in Jefferson Davis' footprints to rant about "segregation forever", the Confederate White House, and some Hank Williams locations. Get an MTA pass for transportation, good on the subway and the buses. A 7-day pass is cheaper than 13 rides, so if you just make one trip out and back each day, you're ahead. You could ask the NYPD for a ride, but you probably won't get one. Another thing you can do is walk around Manhattan. I mean literally walk all the way around it. Plan for two long days or maybe three. According to GPS, the straight-line distance between Kings Bridge, just north of where Broadway crosses the Harlem River from the Bronx at the northernmost tip to the Battery at the southern tip is 21.690 km. Take the #1 MTA train to the first station in the Bronx. Then walk south on Broadway across the bridge over the Harlem River and keep going. This was the best place I've found, a very cool place that was equal parts the opening chapters of The Beach and Hong Kong's Chungking Mansions. Just-big-enough private rooms (!!) and shared toilets and showers. It seems to have closed for the last time in 2014. Click here for some pictures. Jazz Hostel, 36 West 106th, just off Central Park West, +1-212-932-1600, jazzhostels.com. Jazz Hostel, 307 East 14th Street, +1-212-932-1600, jazzhostels.com. Sky Hostel (formerly Columbus Studios) , 106 W 83rd St, +1-212-799-5299, +1-888-6-HOSTELS, nychostels.com. I have liked it the one time I was there, but I got the idea that some of the nychostels.com locations were always in danger of being closed. Village Inn Hostel, 27 East 7th Street, +1-212-228-0828, villageinnhostel.com. I stayed there and really liked it. Then I tried to stay there again just a few months later and found their web page saying "Currently not accepting reservations". I stayed somewhere else, and stopped by to see what was going on. Closed down for safety reasons (inadequate exits for the number of people). Check their web site to see if they have re-opened. Central Park Hostel, 19 W 103rd St at Manhattan Ave, +1-212-678-0491, centralparkhostel.com. They had changed their policy to only accept foreigners and students the last time I tried to stay there. 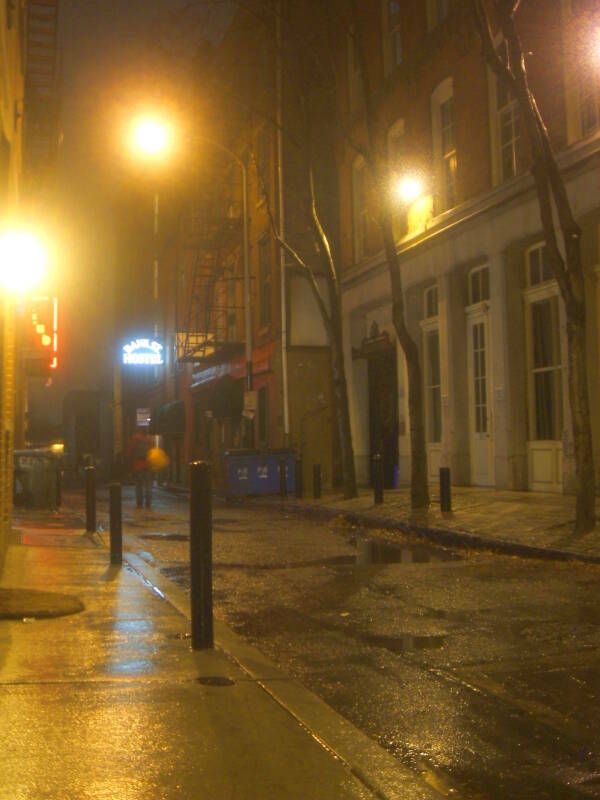 Chelsea International Hostel , 251 West 20th Street, between 7th and 8th Ave, +1-212-647-0010. Part of the Rucksackers North America network, not HI affiliated, thus just as clean and well-equipped but with far fewer rules. Huge, possibly crowded and noisy, and plenty of rules. Other non-HI cheap places in Manhattan include the following. The nychostels.com places keep changing their names so verify the address. Chelsea Center, 313 West 29th Street, +1-212-643-0214. Gershwin Hotel, 7 East 27th Street, +1-212-545-8000. International House, 500 Riverside Drive, +1-212-316-8436, open 15 May - 15 Aug only. New York Bed and Breakfast, 134 West 119th Street, +1-212-666-0559. The alternative is HI's Chamounix Mansion hostel, in the fantastic facility of a historic mansion in a park. However, being a historic mansion in a park, it is something like a one kilometer walk in the dark from the closest bus stop. The HI San Diego Hostel is right in the Gaslight District, and is a very cool place. It's much more laid-back than most HI places, probably due to the location. San Francisco and especially its Haight-Ashbury district was the epicenter of the Summer of Love in the late 1960s, and the source of many musicians and groups including The Grateful Dead and Jefferson Airplane. It was also associated with the Hells Angels and the Symbionese Liberation Army. The district has changed a lot, but it still retains a little of its 1960s vibe. Long before that, Dashiell Hammett made San Francisco the setting for his detective fiction including The Maltese Falcon. What else — Golden Gate Park, the Mission District, the vintage streetcars, great views from the waterfront and the many hills, and side trips to the Marin Headlands, to the Muir Woods, and even to Big Sur. Get a WMATA pass for transportation, good on the Washington DC subway system. A 1-day pass is cheaper than about 3 or 4 rides. A 7-day "short rail pass" is cheaper than 4 day passes and can be used at any time (1-day passes cannot be used before 9:30 on weekdays). The only restriction is that it only covers a limited distance or cost during rush hour, but it covers most trips. There is a lot to see and do in Washington! Check the Friday or Sunday Washington Post and the free weekly City Paper for details on what's up at the many museums, most of which are free. Also see the many free events open to the public at Georgetown University: events.georgetown.edu. 300 Carroll St NW, Washington DC 20012, UTM 18S 0325318 4315894 (WGS84), +1-202-291-9591, hilltophosteldc.com. Hilltop Hostel in the snow. 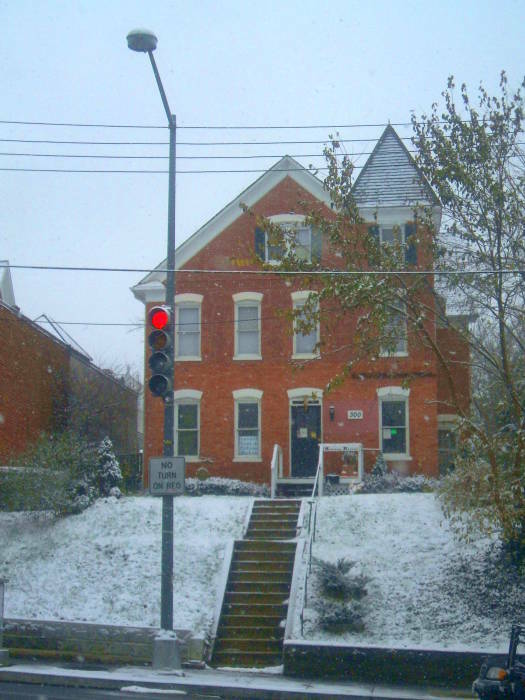 I have also stayed several times at the Capital View Hostel, at 301 I Street WN, +1-202-450-3450. It's just off the northeast corner of Chinatown, not a terribly long walk from Union Station. A newer place to stay is DC Lofty. They have two locations and are aimed at longer-term stays. I've seen about them, but haven't seen the places. As for a downright creepy place to stay, ask for suite 122 at the Residence Inn in Herndon, Virginia. That's where one group of 9/11 hijackers stayed before flying out of the nearby Dulles Airport. I end up at that Residence Inn a few times a year, teaching Linux and networking and information security courses in Reston. It's a very nice place to stay, but I always stay away from the upstairs rooms in the first building. Also see the Baltimore suggestions as it's just a short and cheap commuter ride away on week days. SOME (So Others May Eat) is an organization doing good work to get people off the street. They run a "soup kitchen", really serving more than just soup. They run a shelter, and they offer training and assistance to get people employed and off the street. The HI hostel (see above) sometimes organizes work groups to help run the meal program for a day. Very interesting and very worthwhile. See some.org. 21 panhandlers asked me for money between mid-afternoon and late evening. 20 of them became angry with me for bringing up SOME, and even yelled at me to be quiet or hurried away before anyone else heard them turn down an offer of anything other than currency. 1 out of the 21 was honestly in a bad way, and wanted to know how to find SOME. I was very happy that I could help him.